Residential rental property is the way to make money…or so some people claim. On the surface, it seems likes like a surefire bet; in reality, it’s usually more headache than it’s worth. The challenges start early, and they almost always involve time and money. Being a landlord is not always what its cut out to be. Bad tenants are the largest challenge. Daily calls and late or unpaid rent can add to the hassles. Move-out day is another challenging time. Damage to walls, floors, carpets and other components of the home can lead to disputes and costly repairs. Since every moment wasted arguing is a moment the house sits vacant, you are often better off biting the bullet and paying for the repairs yourself. Speaking of which: You’ll probably need to take out landlord insurance – no, your regular homeowners policy isn’t sufficient – and that’s another item in the ongoing expenses column. Evicting a bad tenant is a troublesome and time wasting process. Just checkout the process a landlord has to follow in Clark County in order to get rid of a bad tenant. But either way, there are proper forms and a legal process that can take time. As a landlord does this sound like your situation? 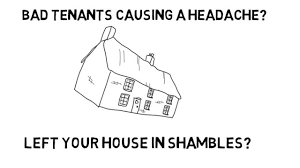 If you just want out….no worries….we’ll buy your rental property AS-IS and handle all the headaches. You’ll receive an all cash payment, plus you won’t have to pay any real estate commissions, closing costs or have to show your property. Get rid of your troubled tenants the quick and easy way, just fill out the quick form or call/text us @ 702-583-7824.